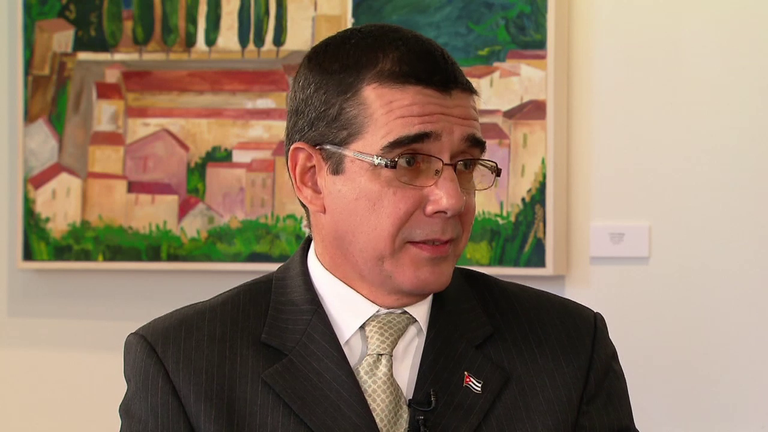 Top Cuban diplomat asks for better ties with U.S.
José Ramón Cabañas, the head of the Cuban Interests Section in Washington D.C., made his first visit to the Tampa Bay area this week. The congresswoman and the diplomat spoke to the Tampa Bay Times editorial board on Thursday morning, then attended a luncheon at the Greater Tampa Chamber of Commerce. Cabañas was also scheduled to meet with officials at Tampa International Airport and Port Tampa Bay and to tour both facilities on Thursday. He was also scheduled to tour Ybor City on Friday. The U.S. has no formal diplomatic relations with Cuba, which is why the Cuban mission is housed in the Swiss embassy in Washington D.C.
“Generally most Americans don’t know what’s going on in Cuba,” Cabañas said. He also noted that the U.S. has formal relations with other nations accused of human rights abuses, such as China. In December, U.S. Secretary of State John Kerry said the two nations were discussing Gross’ situation. Cabañas said Thursday his government is willing to work with the U.S. but has been stymied by the lack of diplomatic relations. Though there are no formal relations between the two nations, Cabañas said both sides have managed to work together on several fronts in recent years. Both have shared data on climate change and hurricanes and both signed an agreement that spells out how to handle oil spills in the Caribbean. And that, Cabañas said, is increased travel between the two nations. In 2013, thanks to new travel policies Cuba, Cabañas said that nearly 300,000 Cubans traveled around the world. In turn, he said up to 400,000 Cuban-Americans visit the island along with 95,000 other Americans through the people-to-people licenses that allows U.S. citizens to visit Cuba legally. Cabañas also praised Tampa International Airport as a gateway to Cuba. Flights between Tampa and Cuba were restored in 2011 after a 52-year hiatus. Since then, more than 100,000 people have used Tampa to get to Cuba, many of them local Cuban-Americans whose only other choice in the state used to be to fly through Miami International airport.